The Center for Adaptive Security Research and Applications (CASRA) was founded in 2008. CASRA emerged from the Visual Cognition Research Group (VICOREG) of the University of Zurich which was founded in 1999. The main aim of CASRA is to increase security and facilitation at airports and other environments involving people and technology. CASRA is a leading organization in security research and applications, in particular regarding human-machine interaction in X-ray screening, selection, training, and certification of security screeners. By combining applied psychology, computer science, and economic analyses, CASRA conducts applied research and develops security solutions in adaptive and interdisciplinary ways. All software, methods, and procedures are based on scientific research and are continuously improved through close collaboration with governmental orga­nizations, research institutes, and end users. Training is an even more important component in order to build the necessary knowledge and skills which are prerequisites of good performance in security screening. We offer highly efficient and effective training which has been developed in close collaboration between scientific and aviation security experts together with end users. According to EU regulation (EC 300/2008 and EC 2015/1998), for classroom and/or computer based training in aviation security, at least 6 hours every 6 months are mandatory for each person operating X-ray equipment. CASRA’s success is documented in more than 100 publications, many funded projects, international collaborations, and software products that have been installed in more than forty countries at more than 900 airports and other sites worldwide. 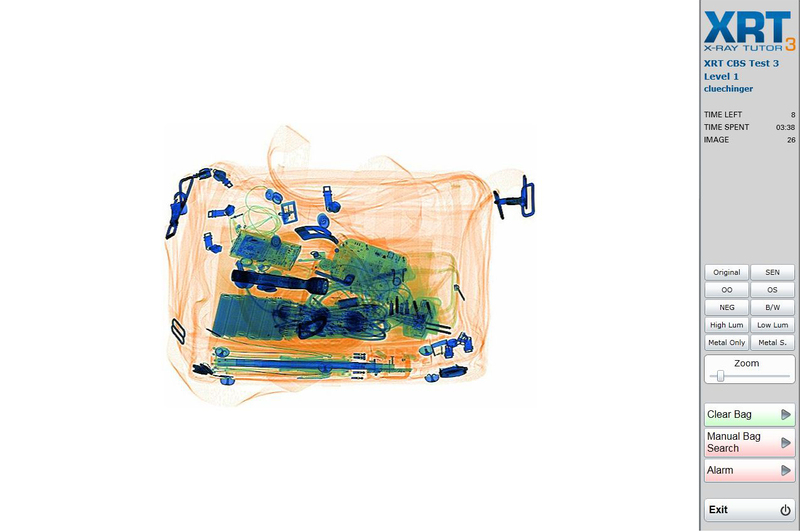 CASRA is recognized internationally as one of the leading security research centers with a focus on X-ray screening. We have 16 years of experience with hundreds of airports worldwide. We participate at large and innovative research initiatives funded by the European Commission, airports, governments, and security companies. Our research is documented in more than 100 publications and it has often been considered for policies and regulations. We are your ideal partner if you would like to optimize and innovate security screening using an interdisciplinary and adaptive approach based on solid science. Selection of suitable employees is a very important component for increasing performance in security screening, as not everyone has the aptitudes and abilities to become a good security screener. Training is an even more important component in order to build the necessary knowledge and skills which are prerequisites for good performance in security screening. Certification of security screeners is essential to secure the security stan­dards. Therefore, CASRA offers highly reliable, valid, and standardized tests to measure the theoretical and practical knowledge as well as X-ray image interpretation competencies. All software solutions are available online or can be installed locally. The X-Ray ORT has been developed to provide a fair and comparable assessment method to reliably measure the visual abilities of an applicant and is a fast and easy-to-use tool in the employment procedure of potential X-ray security screeners. Scientific studies have shown that employees with distinctive visual abilities can learn faster and generally achieve a 20% higher level of threat detection performance in certification tests compared to X-ray operators hired without a previous pre-employment assessment using the X-Ray ORT. The X-Ray ORT is designed for people with no previous knowledge of how items are displayed on an X-ray machine. The test therefore only contains grayscale images and only shows guns and knives as there need to be commonly known items. The items selected for this test systematically vary in the level of difficulty based on bag complexity, superposition, and object rotation. 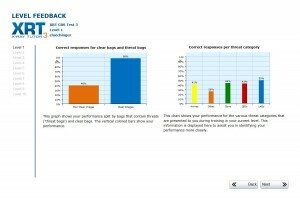 These are the image-based factors that highly influence threat detection performance. The images for the test were created and pre-validated by security experts and psychologists. Therefore, the X-Ray ORT features excellent reliability coefficients with both Cronbach’s alpha and split-half values above .90 (.80 is considered as the minimum standard). X-Ray Tutor (XRT) is the only training system on the market designed on the basis of scientific studies and taking into account the complex brain processes underlying the perception of visual information. The effectiveness of the system has been proven in several studies, showing substantial increases in detection performance. Due to the adaptive level system, every user is presented with images tailored to his/her individual knowledge and skills. This ensures that the user is optimally challenged by the presented images and maximizes his/her motiva­tion to achieve the next level. XRT is available for different fields of operation and contains high-quality X-ray images of several hundred prohibited objects in various rotations and several thousand containers (e.g. bags, parcels – depending on the field of operation). All images are regularly updated based on a systematic threat assessment in cooperation with international authorities and experts. 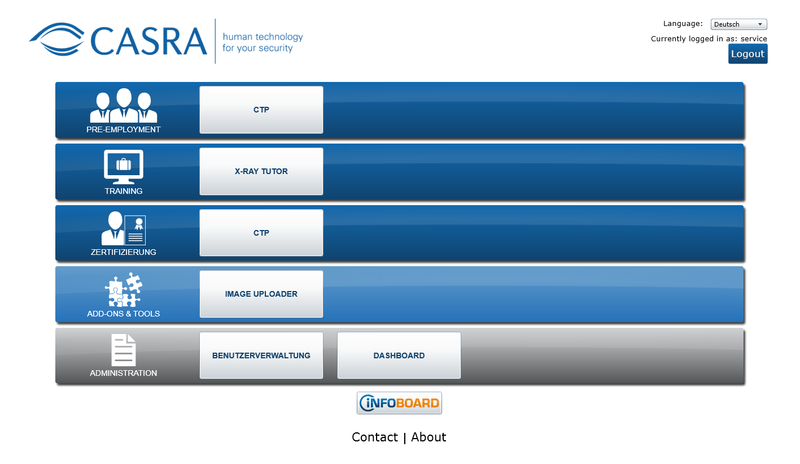 The CASRA learning system is an e-learning platform for theoretical and practical knowledge with high flexibility in implementing and managing the learning content as well as easy monitoring of the users’ learning process. The X-Ray CAT was developed according to the EU regulation as well as the ECAC Handbook and is available for various fields of operation (cabin, hold, cargo or mail screening). The tests are currently being applied in several countries worldwide as official certification tests. Developed by former X-ray operators and psychologists in close collaboration with aviation security experts, it meets the claim of both being in step with op­erational experience and fulfilling high statistical quality standards. The images for the tests are hand-picked based on scientific criteria and go through a series of pre-tests in order to adhere to the highest standards. Additionally to its function as a certification test tool, the X-Ray CAT offers the op­tion to use it as a tool to determine individual weaknesses of the security officers. The SecTEC is a software tool that allows you to test theoretical knowledge of security-related topics using carefully prepared multiple-choice questions. It offers an objective and fair test instrument which meets stringent quality criteria. With CTP Plus you have access to a higher degree of customization and individual test configuration. 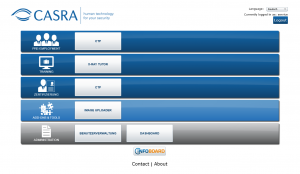 CTP Plus administrators can create and configure their own X-ray image interpretation tests, either based on a CASRA X-ray image interpretation test or consisting completely of individually uploaded images. Download the CASRA Newsletter Today! A research project on unpredictability in aviation security has recently started. It is conducted in collaboration with Zurich State Police, Airport Division and the Federal Institute of Technology Zurich (ETHZ).